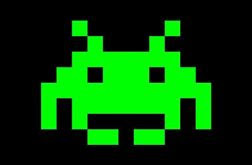 Space Invaders, now that's bringing it back old school! Who remembers playing the arcade video game? Space Invaders (video game and name of the polish) is what My Indie Polish was inspired by for their April 2018 Polish Pickup contribution - it's a fun one! The theme for the April Polish Pickup is Across the Universe, Planets and Galaxies. 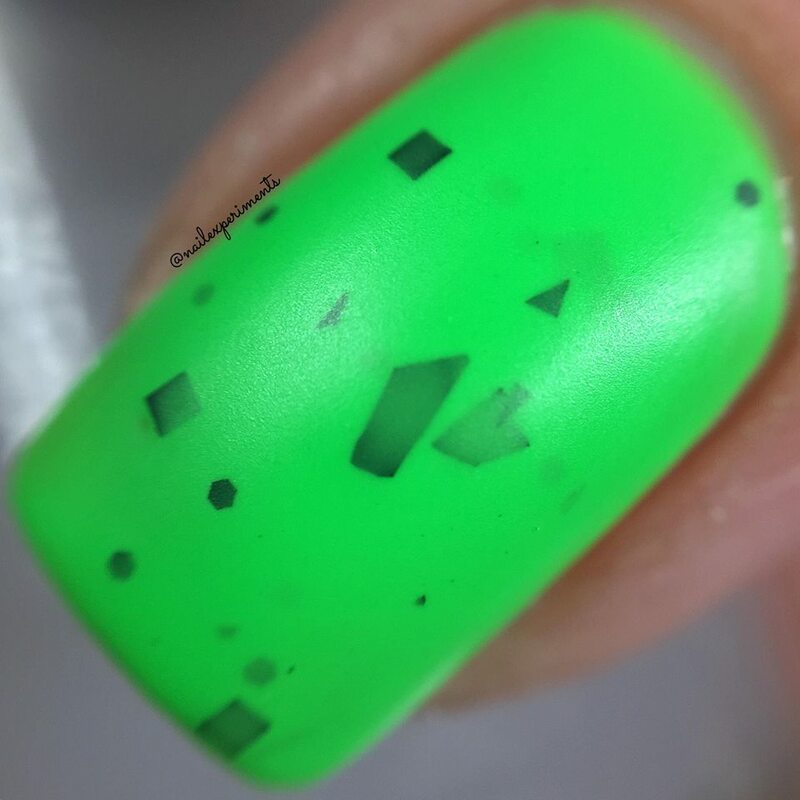 My Indie Polish decided to go a little bit outside the box on this one and love her inspiration using Space Invaders. 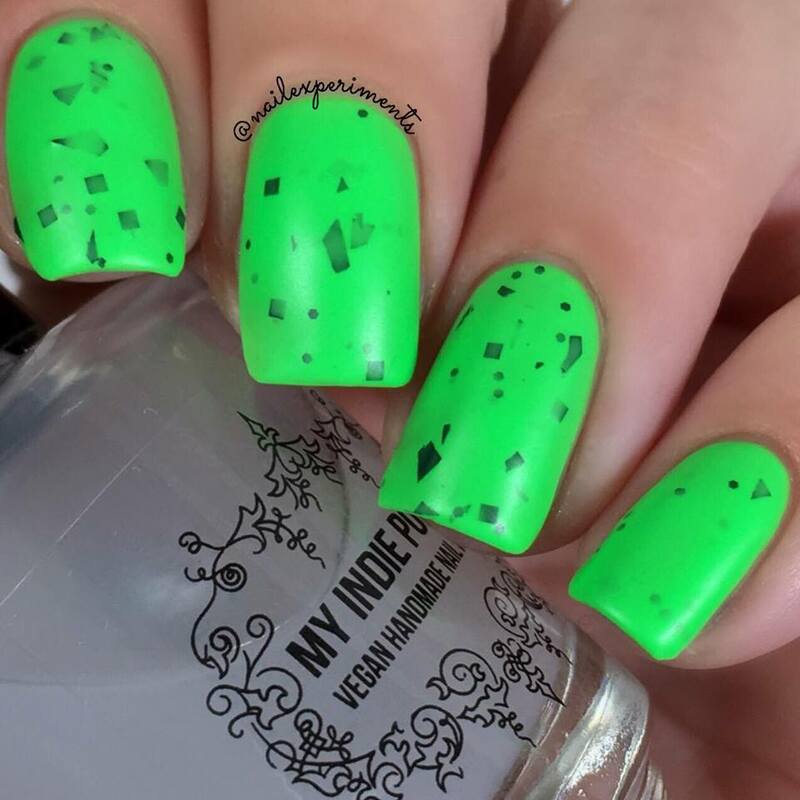 Along with Space Invaders, My Indie Polish is offering a second items for the month of April being their , My Perfect Matte Top Coat. 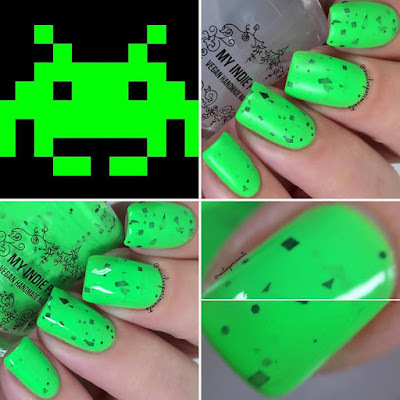 I will be including swatches of Space invaders in both glossy and matte for comparison. Space Invaders is a neon green crelly with black glitters. My swatch of Space Invaders is shown in 2 easy coats, paired with top coat. This polish dries down to a satin finish and does require a glossy top coat for a shiny finish. 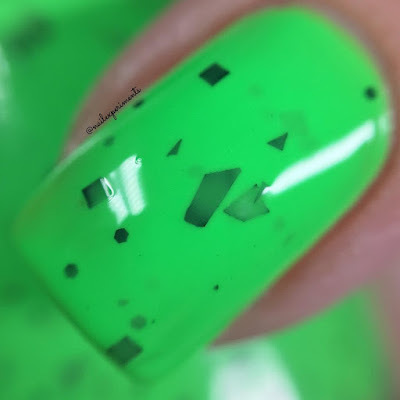 This was basically a 1 coater coverage polish and went with 2 out of habit. I will say I had a difficult time capturing the full colour payoff as this green in person is a lot richer in colour. Very comparable to the Space Invaders character! Indoor lighting can be challenging sometimes I'll tell ya! Space Invaders will have no cap and will be priced at $12.50 USD. 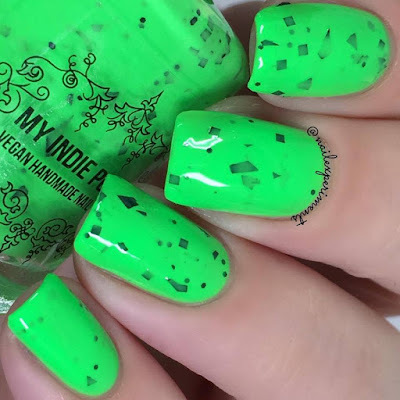 The matte top coat is not exclusive to the polish pickup and is available as a staple item on the My Indie Polish website for reference. On my polish desk I have a mini rack of essentials; base coats, top coats, latex barriers etc. Within that mini rack, I have 2 matte top coats (I'm super picky) that I always keep out and this is definitely one of them! 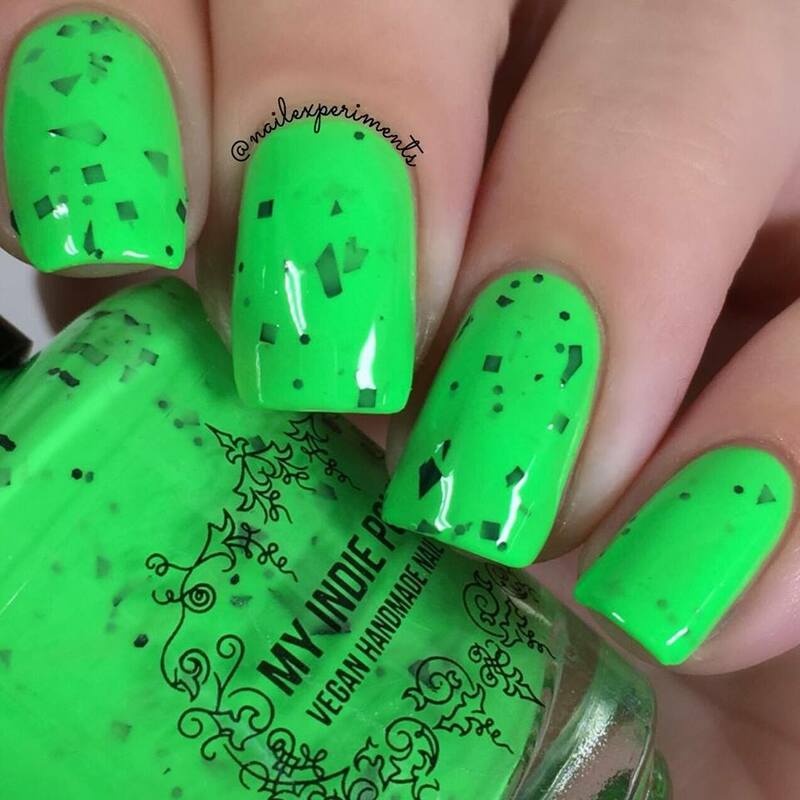 I've been a long time fan of this matte top coat as I've been using it quite a long time! 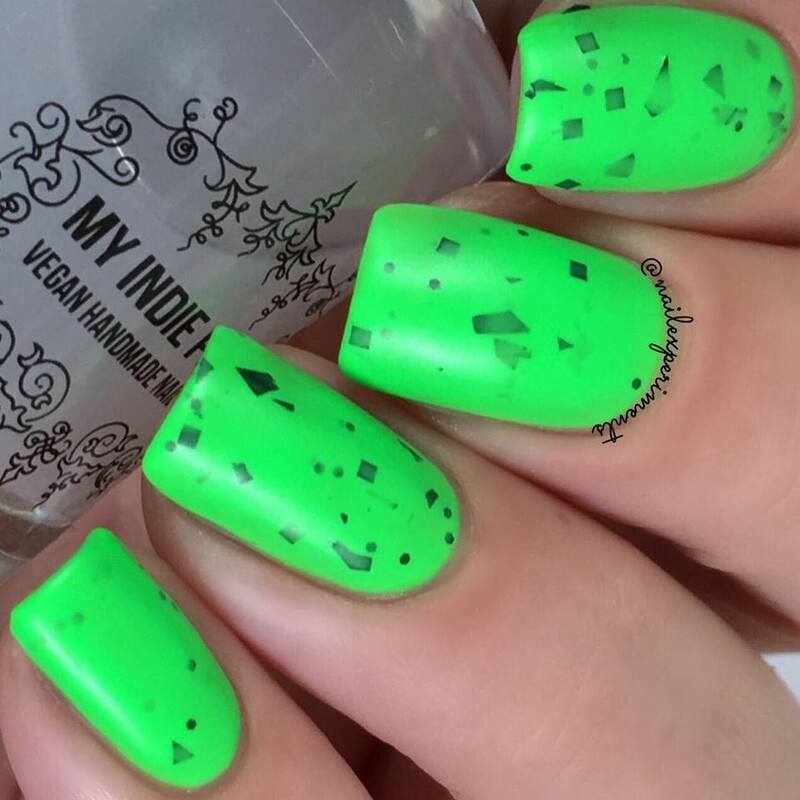 The My Perfect Matte Top Coat will have no cap and will retail for $9.75 USD. My Indie Polish products, along with all other Polish Pickup polishes/products will be available for pre-order between April 6th - 9th only. 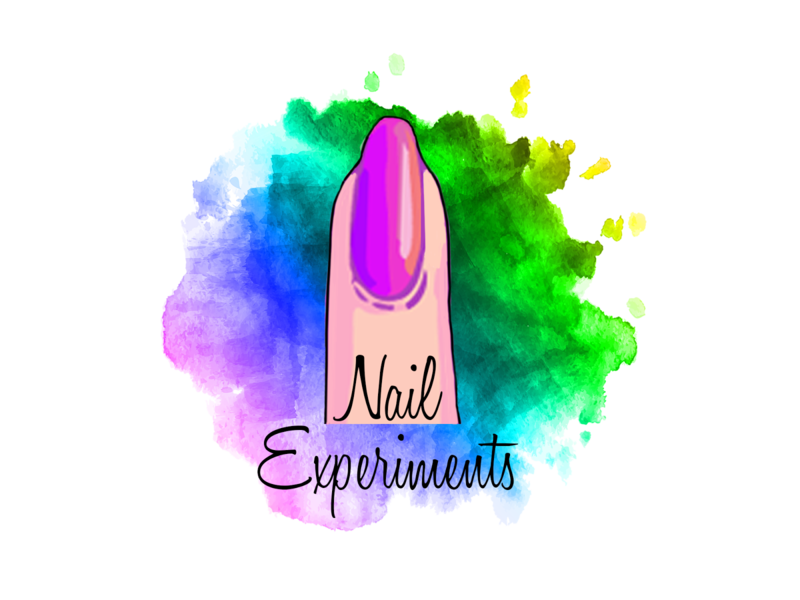 For more info on My Indie Polish, check the links below!